The 24-year-old American notched the biggest result of his career this year north of the Arctic Circle. On one of the windiest days he could remember, Rally’s Colin Joyce was already several echelons back midway through stage 2 at the Arctic Race of Norway. The combination of tricky conditions and a lumpy profile blew the peloton apart early in the afternoon. With so much ground to make up approaching the day’s final climb, Joyce was close to accepting his fate, but he didn’t. 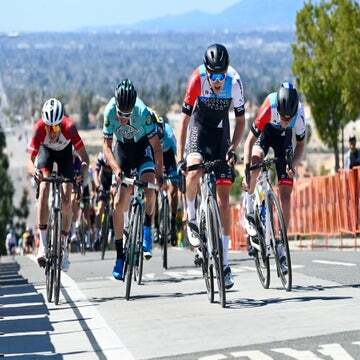 Instead, he kept his head down and relied on some help from teammates like Matteo Dal-Cin and Robin Carpenter to work his way through the groups. Somehow, he ultimately found himself in the main chase group on the day’s final climb behind a small late escape that included Astana’s Jakob Fuglsang. When the chasers swept up the move, there was Joyce, in with a chance at a stage win in a European race against some big-name WorldTour talents. He didn’t let the opportunity pass him by. On the finishing straight, Joyce sprinted to the win ahead of Israel Cycling Academy’s Dennis van Winden. It may not have scored front page headlines, but the victory marked Rally’s first UCI HC-rated win in Europe this season, and Joyce’s first pro win in Europe. He would cap it all off with a third-place overall finish in the race. That result gave Rally something to hang its hat on in a season that saw the American Pro Continental team invest in expanding its European calendar. It was evidence that Joyce had what it took to win across the pond, and it came in the middle of transfer season, boosting his profile for prospective suitors. 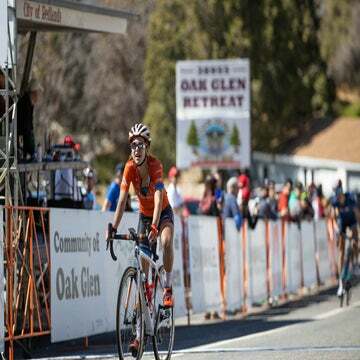 At the same time, it also gave the 24-year-old American reasons to stick with Rally into the 2019 season — Joyce told VeloNews this week that he has re-upped for a third season with the team. In short, stage 2 of this year’s Arctic Race of Norway was worthy of an inside look. 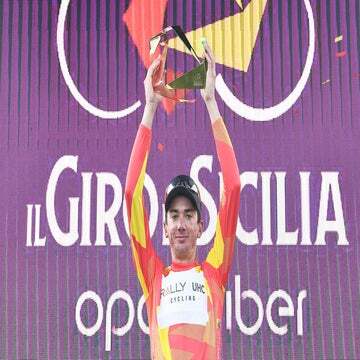 Rally Cycling jumped into the international racing scene early in 2018, sending teams to races like the Volta a la Comunitat Valenciana in January and the Dubai Tour and Tour of Oman in February. Brandon McNulty’s near miss in the Dubai queen stage garnered the riders in orange plenty of coverage, but on the whole, it was a challenging stretch of events that saw Rally struggle to contend. Even in second- and third-division stage races, the WorldTour teams were still riding on another level. He returned to his hometown of Pocatello, Idaho, and trained there in July, taking advantage of the altitude and nearby climbs like Scout Mountain to round his way into form for another big European campaign set to begin in August. The team had accepted an invite to the Arctic Race, where Joyce knew there would be opportunities for a rider with his skill set in the lumpy stages north of the Arctic circle. The first race on Rally’s August trip was the Tour of Denmark. Joyce and his coach made a plan to come into that race slightly undercooked, with the hope of riding into peak form between the five stages there and the Dutch one-day Koga Slag om Norg. Strong form or no, the opening stage in Norway did not go according to plan. Joyce and his teammates tried to make the most of a bad situation when a group of around 25 riders went up the road with no Rally jerseys in the fray. The American team spent the rest of the stage hammering at the front. The second stage, of course, worked out a differently — although the first few hours of the day were even more hectic. Stage 2 ran 195 kilometers from the town of Tana to the fishing village of Kjøllefjord. The journey took the peloton close to mainland Europe’s northernmost point. The green but rugged landscape of Norway’s Finnmark region, which Joyce described as looking like “another planet,” makes for incredible scenery — and it also offers little shelter from the intense winds that whip across the road. Rally landed Carpenter in the break. As the wind picked up and Astana and BMC Racing upped the tempo, the pack was blown apart. “There were so many breaks and splits in the peloton and you’re riding through echelons and people are flying off the road because it was so windy,” Joyce says. Joyce found himself a few echelons back as the race neared the day’s final climb. He knew he had this one last chance to move up. “By the top of that climb you were going to be in the group that you were going to be in,” he says. Despite the wind and the chaos and the high caliber of the start list around him, Joyce was able to push his way up the main group. The early break was caught, which gave Joyce an ally in the move in the form of Carpenter. From there on, it was a matter of bringing back a dangerous late move that featured heavy hitter Fuglsang, while also trying to recover from the climb. The chase group achieved that first objective with around 10km to go. That gave Joyce enough time to start thinking about a possible sprint. “I wouldn’t say I ever thought I was the fastest guy there. I just always thought I had a shot,” he says. Joyce stayed alert to a number of late escape attempts, and a group of 10 riders came into the finish together. Van Winden launched first rounding the final corner, with BMC’s Danilo Wyss close behind. Joyce jumped onto Wyss’s wheel, and then made his move with 100 meters to go. In the all-out push to the line, Joyce narrowly triumphed over van Winden, pipping him by a few inches. Joyce survived the next two days of rolling climbs and roadside caribou sightings to seal third overall behind Astana’s Sergei Chernetski and Israel Cycling Academy’s Sondre Holst Enger, marking Rally’s strongest European GC result in 2018. Joyce’s European campaign, and Rally’s in general, may have gotten off to a rocky start, but rider and team closed out the season on a high note. They will roll into 2019 with a few international results to build off. Joyce’s strong August did not go unnoticed in the peloton. A free agent during this transfer season at the end of his original two-year Rally deal, he says he had some interest from other squads. Nonetheless, the 2018 season and Rally’s longer-term plans gave him good reasons to stay in orange next year. “They’re growing pretty similarly to my own growth,” he says. “It’s tough, I’m getting older, but at the same time, I think this team is doing bigger and bigger races that match my own personal growth of doing bigger and bigger races, but not doing them too quickly or too many too soon. With that in mind, and after a healthy break that included some time on the beach in the Dominican Republic, Joyce is headed into his offseason ready to continue his development, preparing for a 2019 calendar that will likely include plenty more racing in Europe. This time, however, he’ll start the season with proof in his palmares that he’s got what it takes to win on the other side of the Atlantic.